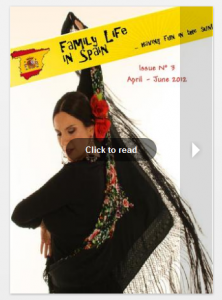 Well here it is, our third Family Life In Spain Newsletter! Once again we would like to thank all our contributors for their help in compiling this bumper issue. We have welcomed new contributors from different parts of Spain and are still looking to add more so do not hesitate to contact us if you would like to join our team. We hope you enjoy reading it and we look forward to your feedback and comments sent to us via our website or via email : familylifeinspain@gmail.com. Remember that you can download the newsletter onto your computer so you can read it whenever you like! If you click any of the links on the pages they will take you direct to the websites.